Every evening after our final session we would gather in the meeting room and share some photographs for a friendly critique. While it can be unnerving to put your work on display, it can also be an incredibly useful practice. It’s easy to be overly critical of your own work, and having a bunch of objective eyes and opinions can help reveal the things you did well – and those you did not-so-well. I particularly benefited from hearing the other photographers’ takes on their own pictures: what they liked about the image, why they set it up the way they did, what techniques they used. It made me wish that there was a photography club near where I live, because it would be awesome to have these kinds of exchanges with other people on a regular basis! Before our first critique session, we were treated to a talk that covered some considerations that we can keep in mind when composing the image. On some level, most of us can recognize a “good” photo when we see one; very often these photos are following a few well-known rules for creating aesthetically pleasing images that tend to resonate with viewers. 1. Photos are often easier or nicer to look at if the point of interest is not dead-center. Try the Rule of Thirds! This is a simple technique that you can apply either when taking the photo or later on when you crop during post-processing. Here’s a nice example to illustrate how this works. An example of a photo that follows the rule of thirds. Image from Wikimedia Commons, used under a Creative Commons Attribution-Share Alike 2.5 Generic license. Basically, you imagine that your image has a grid overlaid on top of it that divides the image into three equal parts both horizontally and vertically (the image above is square, but in a rectangular photo, each “section” would appear more rectangular). You then try align points of interest with those grid lines. In the example above, the horizon lies along the lowest horizontal third, and the tree is aligned with the vertical third on the right. Now, that’s not to say that a dead-centre image can’t be arresting and visually beautiful, but do give this little trick a try and see how you like the results! 2. Keep the background simple/uncluttered. Whether or not you apply this tip is going to be dependent on the type of story you want to convey. If you’re photographing a cryptic insect on a substrate that helps illustrate its mastery of camouflage, then an uncluttered background isn’t necessarily going to work well. If, however, a busy background is not part of your story, try to simplify it so that the main focus of the image is pronounced. One way to check whether your focal point stands out is to convert your image to grey scale; after this, is the subject still very obvious? Consider, for example, these two photos I took of the same subject: two very different objectives are achieved here. 3. Pick your perspective! Different heights or angles can convey different stories. For example, try getting below the bug and pointing the camera up at it! 99% of photos of insects tell the story of “large human looks down on tiny bug”. Getting down to or below the insect’s level instead changes the way you think about the subject. 4. Don’t forget the human element! Show people interacting with insects. It can put the image in context, add a little whimsy and playfulness, and might even help demystify our little insect friends for the viewers. That wraps up my BugShot tips! Other great summaries have been posted here, here, and here, if you’d like to get some other participants’ perspectives on the event! Tomorrow is Photo Friday, which means that I’ll finally be sharing some of my favourite shots from the workshop! The participants at BugShot were a varied bunch, with different levels of experience in both photography and entomology. Alex Wild expressed several times that, in some ways, the entomologists had a slight advantage because of their existing knowledge of the subjects. Insects are a notoriously squirrely lot, prone to moving, jumping, flying and hiding. Many are cryptic. Some sting or bite. Others can only be found in specific habitats or locations. Also, many have fascinating behaviours and natural history that are screaming to be captured on film, but might not be noticed by a non-buggy photographer. Note: being an entomologist does not guarantee success. This velvet ant was very active and delivers an extremely painful sting. Despite my efforts, this was the best shot I managed (a petri dish lid was slammed down over it about a nanosecond after I snapped this pic – it was about 6 inches from my face). John Abbott gave a great presentation on the first day, an Entomology 101. I was impressed by the amount of material he was able to cram into a two-hour session! Rather than repeat everything here, I suggest that you check out this Storify for a summary of the tweets I wrote during that talk. You’ll note that he covered everything from taxonomy to morphology – it’s a lot to know! But the important take-home message was basically this: taking the time to learn a bit about insects will make it easier to find and photograph them. Also, your insect photographs will more likely be useful scientifically. A great place to start if you’re interested in learning more is to get a couple of field guides. You can find guides that cover specific groups or geographic regions, or more general guides that try to touch a little bit on every major order of insect (not an easy task, considering there are millions of different species!) Entry-level text books are another option for those who want a little more detail, or who want to tackle the challenge of an identification key. If you’re in the field, be aware of how you’re approaching the insect. Vibrations, movement and sudden shadows can cause your perfectly-posed bug to fly, jump or scoot under a leaf. Put your mad stealth-ninja skillz to work, and don’t rush. Likewise, be aware of your equipment and know your working distance. Long snoot diffusers or long lenses can accidentally bump an up-close subject. Try taking photos early in the morning, while the bugs are still cool and quiet and not so skittish. It’s a nice chance to get dewdrops and lovely ambient light, too. If you’re working in the studio, have some kind of cover handy to place over a running insect. A petri dish can work well (you can see through it so will know when it settles). But, since it lets in light, it might take longer for your bug to quiet. Alex reported that he’s waited out some particularly frisky ants for several hours as they ran in circles around the lid. Assume that you have three seconds or less to get that shot after you take the cover off your now-calm subject – get that photo fast! You can try rapidly cooling a bug in the freezer – just long enough to stop it, but not long enough to kill it, obviously. Don’t bother trying to take a photo of a frozen bug – they look stupid, frankly. Usually they’ll slowly rouse and sometimes will take a moment to groom before taking off again. Alternates to the freezer include a whiff of CO2 if you have it, or ethyl acetate (the same stuff used in killing jars). Again, be careful to only administer enough to knock the subject out momentarily. Try using a red filter over the light source you’re using to focus on your subject, rather than a white one; it might not disturb your insect as much and could encourage it to calm. If you’ve got a flying subject in a white box, a drape of white fabric with a hole cut out to permit access for your camera might be your best friend. If it suddenly takes off, it will remain contained in the box. Tomorrow we’ll have a few quick tips for composition! If you haven’t seen them yet, check out the BugShot instructors’ Top Five Tips for insect macrophotography! Over the next few days I’ll be writing more detailed posts on some of the subjects that I found most interesting; I hope you’ll find some tidbits of information that are helpful for your own photographic adventures. 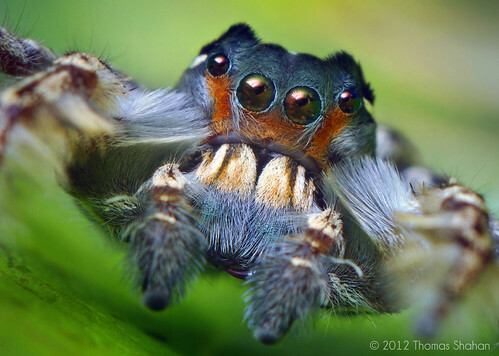 Thomas Shahan is a master of magnification, known for creating breathtaking in-your-face portraits of jumping spiders. Here are some of his suggestions for achieving greater magnification when shooting small critters. As a “starving student, I particularly appreciated his DIY/second-hand-stuff approach to a lot of this! It just goes to show that expensive equipment is not necessarily the be-all and end-all of fantastic photography. One of the critical points to consider is that the higher the magnification, the lower the depth of field . A smaller aperture can help compensate for this, so stop down the lens. Also, photo-staking in post-processing may be an option you want to explore. In the meantime, how can you achieve higher magnification in your images? Dedicated lenses – these are out-of-the-box ready to use for high-magnification photography. They’re easy to use, but they can be pricey. Both fixed and zoom lenses are available. Extension – add a bellows or extension tubes to gain distance between the sensor and lens. No glass is added in this setup, only space. These can be quite inexpensive, and are easy to find online at places like ebay. Be warned, though, that with some of the cheaper kits you lose control of the len’s automatic features and may need to adjust things like aperture manually. Reversing – Take an old (inexpensive) non-macro lens and mount it backwards using a macro reversing ring designed for the task. This approach is simple, cheap, and powerful. No extra glass is added, so there is no loss of image quality. However, this is probably not something to try with an expensive or heavy lens (think second-hand 28 or 50 mm). Thomas uses reversing to achieve his incredible spider shots! Close-up filters – This is a secondary lens applied to your existing lens. One example is the Raynox DCR 250 snap-on; I can personally attest to the utility of this lens since it’s the one I use with my Canon PowerShot SX10. These filters are easy to use but they do add glass , which can affect the image quality. Stacking lenses – This is exactly what it sounds like. You can add, for example, a reversed lens to a telephoto or zoom lens. The pros of this approach are that it uses equipment you already have (so may not be as expensive as buying a new dedicated lens) and you can achieve high magnification. However, it also adds lots of extra glass, causing chromatic aberration. Also, it can be super-heavy. 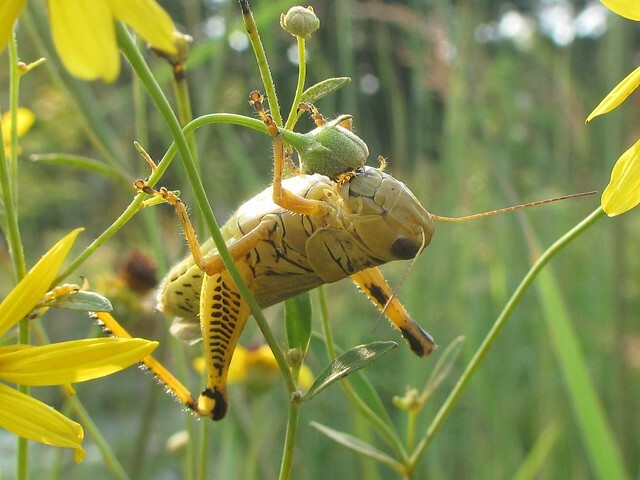 On a hazy, warm, sunny morning in late summer, a grasshopper feeds on the bud of a yellow composite flower . This photograph was taken at the Shaw Nature Reserve in Missouri, while at BugShot 2011. 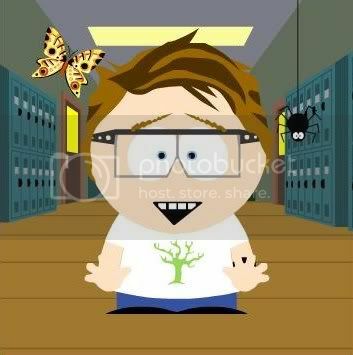 On that note, I want to thank everybody who has supported my fundraising efforts to attend BugShot 2012. Thanks to your generous donations and your enthusiasm for consuming hot beverages out of geeky mugs, I am 60% of the way to my goal! I can’t even begin to express my gratitude…. This image (note the yellow) makes me yearn for warmer weather. Oddly enough, the forecast here is calling for temperatures in the high teens and mid-twenties (degrees Celsius!) for the next few days – totally unheard of for mid-March! I’m feeling optimistic about getting some new photos this weekend!